Our planet produces enough food to feed its more than 960 million undernourished people. The basic cause of global hunger is not underproduction; it is a production and distribution system that treats food as a commodity rather than a human right. In developing countries huge agribusinesses, fat with government subsidies, sell their unsustainable (and sometimes genetically modified) products at a reduced rate, thus making it impossible for local farmers to compete. Farmers who can’t compete can’t feed their own families or work their own fields. Hunger becomes both the cause and effect of poverty. Ruth Messinger, president of American Jewish World Service, says sending food aid is not a sustainable way to end hunger. Rather, people must be empowered to raise their own food. She proposes Ten Things we can do to help solve the world’s growing hunger problem. Write letters to the editor and op-ed articles in your local paper calling on the government to cut or end subsidies that encourage large agribusinesses to overproduce grains and dump their surpluses on the developing world at sub-market prices. This ultimately places poor communities at the mercy of volatile global commodity prices. Learn more at The Institute for Agriculture and Trade Policy for more information. 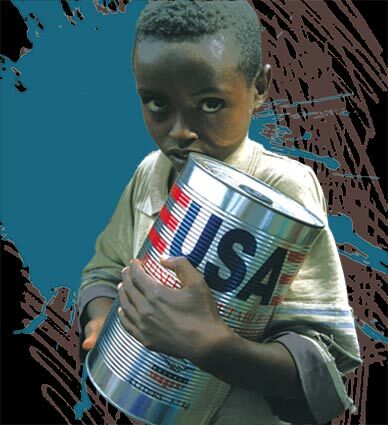 Ask your representatives in Congress to demand that more foreign food aid be in the form of cash and training rather than food. Farmers in the global South know how to grow food but lack the resources, inputs and tools to farm effectively, develop markets and compete in the world marketplace. Learn the specifics of what makes products “fair trade.” Buy them where available. Download “Green America’s Guide to Fair Trade” for a definition of “fair trade” and a list of organizations that follow these specifications. Conserve energy. With a reduced demand for fuel, global commodity prices–which spiked as the cost of fuel for shipping rose dramatically last year–can remain more stable. This is important because while sending food to poor countries is not the ultimate solution for ending hunger, Food Aid has a role to play due to the desire for variety in food supplies. And, more importantly, natural disasters or political instability will always cause humanitarian emergencies where the flow of aid is crucial. Pressure the Obama administration to come up with a renewable energy policy that does not stress ethanol and other biofuels. As demand for biofuels has grown over the past few years, farmers in the developed and developing worlds have set aside more and more land for fuel production, degrading the environment and reducing food for human consumption. Eat less meat. Every pound of meat produced requires sixteen pounds of grain; food given to farm animals each year could feed the world’s hungry with plenty to spare. Search “Diet for a Small Planet” and “We Feed the World”. Support grassroots projects that advance sustainable agriculture at the community level. Organizations like American Jewish World Service partner with grassroots organizations in the global South that use sustainable farming techniques. Persuade your local editorial writers to cover hunger in a way that focuses on economic rights rather than food scarcity. Emphasize that the underlying causes of poverty are political instability, joblessness, gender inequality, illiteracy and limited access to education, loss of land, disenfranchisement, forced migration and preventable epidemics. These hamper local food production and sustainable development. Click here for current coverage. Demand a worldwide reduction in the sale of pesticides, herbicides and genetically modified seeds, which benefit large agribusinesses like Monsanto because they do not reproduce, forcing farmers to purchase new seeds year after year. Watch Future of Food for more information. Advocate for food security as a human right. Even though the United Nations has declared that nutrition is a universal right, many member nations have adopted policies that reinforce a global system whereby food is treated as a commodity to be bought and sold by speculators. Read “The Politics of Hunger.” Remember that global hunger is a local problem, a feminist problem, a socioeconomic problem and, most urgently, a political problem that can be overcome.